The MicroTime 200 (PicoQuant) is an inverted objective-scanning confocal fluorescence microscope for time-resolved experiments. This microscope has single-molecule sensitivity, and is used for fluorescence correlation spectroscopy (FCS — standard-focus and dual-focus), single-molecule Förster resonance energy transfer (single-molecule FRET), and fluorescence lifetime imaging microscopy (FLIM) measurements. The Zeiss LSM 880 is an inverted laser-scanning confocal fluorescence microscope integrated with an upgrade by PicoQuant, particularly suited for live-cell experiments using time-resolved techniques. 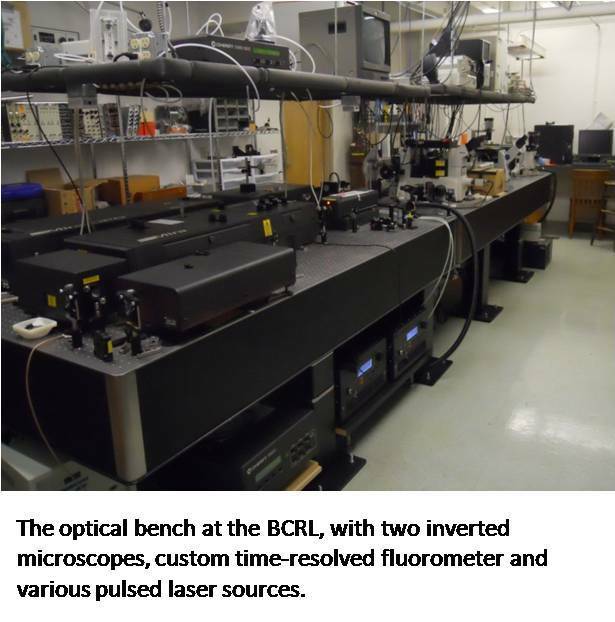 This microscope system is used for fluorescence correlation spectroscopy (FCS), single-molecule Förster resonance energy transfer (single-molecule FRET), and fluorescence lifetime imaging microscopy (FLIM) measurements. The Nikon TE2000U inverted microscope has four ports for observation and has been configured for direct excitation fluorescence imaging and Total Internal Reflection Fluorescence microscopy (TIRF) using an Andor iXon 897 EMCCD camera. The TIRF configuration currently supports single-molecule Förster resonance energy transfer (single-molecule-FRET) experiments. The FLASC 1000 Time-Correlated Single-Photon Counting (TCSPC) Fluorometer is for time-resolved fluorescence experiments. The fully automated fluorimeter, designed and constructed in collaboration with Quantum Northwest (Liberty Lake, WA), uses a modified ‘T-format’ optical arrangement that permits simultaneous collection of multiple decay curves. The sample chamber is temperature controlled and can accommodate different sample holders, including standard cuvettes, a high-pressure cell, or a goniometer for crystal samples. The FLASC 1000 is used for fluorescence and phosphorescence lifetime measurements and time-resolved anisotropy measurements. The SpectraMax M2 is a dual-monochromator, multi-detection microplate reader with a dual-mode cuvette port and 6-384 microplate reading capability. This instrument performs steady state absorbance measurements with a wavelength range of 200-1000 nm, fluorescence excitation measurements from 250-850 nm, and fluorescence emission measurements in the wavelength range of 360-850 nm. The Mira laser system can be mode-locked to provide picosecond or femtosecond pulses of light and is tunable to wavelengths between 680 and 1050 nm. The output is pulse-picked and frequency doubled or tripled to generate wavelengths between 260 and 520 nm. This system is used for time-resolved spectroscopy and microscopy experiments. This Ti:Sapphire femtosecond pulsed laser (Chameleon) is available for multi-photon microscopy experiments. These fiber-coupled, picosecond-pulsed laser diodes at 440 nm, 470 nm, 478 nm and 637 nm, operate with a frequency range from single-shot to 40 MHz, are used with the time-resolved fluorometer as well as the Nikon and TE 2000. This CW diode laser at 552 nm is used for TIRF microscopy with the Nikon TE 2000.